Thank you for the copy, Denver. I suppose that “other buildings” might be construed to include private residences. But normally the manner of administering the gospel in homes is left to the patriarch of the family. May 3, 1978–that’s five weeks prior to the more famous 1978 letter signed by this same First Presidency. Thank you Denver. Michael–I noticed/thought the same thing. 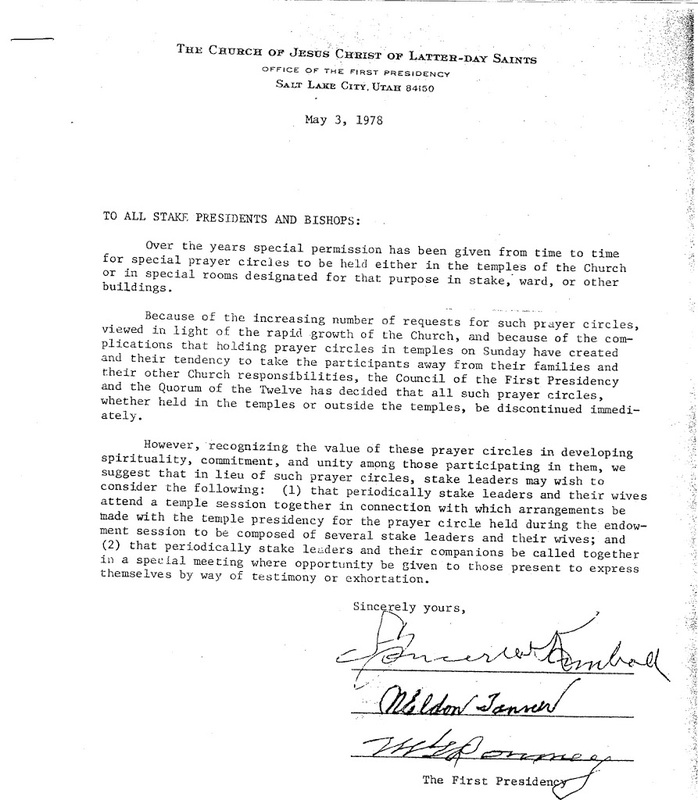 I was not sure if this letter was instructing Stake Presidents and Bishops to discontinue prayer circle in their respective callings….which I understand was a common practice in stakes/wards with dedicated prayer rooms in their building. I’m not sure about the True Order of Prayer by individuals in our homes. I wonder if the one letter had to do anything with the other. Notice how this applies only to “special” prayer circles and how they define what those special prayer circles are. It did not stop regular, or standard prayer circles. Isn’t stopping people from “finding the mind and will of the Lord” … kind of contrary to what they teach … to seek the face of God? Interesting how this document gives no instruction on individual prayers, which may be after the true order– it only says that all such “prayer circles” should be discontinued. I don’t recall Adam, who appeared to be praying after a higher order, being surrounded by a circle of participants. So my question Denver, is where one can look to receive further instruction on the appropriate way to pray after this manner? Anonymous @9:54. I noticed that too and was wondering the same thing. Bro. Denver, can you share your insights? Today it is an offense to church rules to engage in this form of prayer. Both the Salt Lake and Provo Temple recorders have confirmed that it would cause a churc disciplinary proceeding if someone were caught. I can’t check the Church Handbook right now but I recall it being discussed in there as inappropriate. So I cannot answer the question. How odd – to be taught how to approach the throne of grace and then told you can only do so in a certain place with someone else’s permission. Did not Joseph talk about having found a way to approach Deity and get an answer? I wonder if it would be an offense to God to approach Him in this way? Truly they have tried to lock the gate without going in themselves. I looked in the handbook and couldn’t find it. I didn’t say prayer circles had not been stopped, but the 1978 letter stops only “special” prayer circles. It’s by “enlarging the statutes” of the letter that other prayer circles have fallen prey. And yes, more likely than not, some sort of “churching” activity would occur. If Denver is right in that church discipline is given or threatened for using the TOP outside the temple, and I have independent confirmation that it is, then we have come a long way from the day when this church claimed the privelage of worshipping Almighty God according to the dictates of our own conscience AND ALLOW ALL MEN THE SAME PRIVELAGE. I gather that it is more important that you knock with an understanding of the symbols more than you knock with symbols themselves.